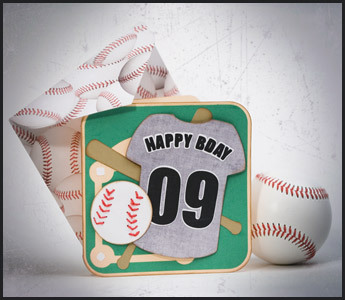 Make the perfect birthday card for your baseball fan using your Cricut or Cricut Expression and Sure Cuts A Lot software! Support a favorite team with whatever colors you'd like for the jersey, letters and numbers! We used gray, white and black because we're big Chicago White Sox fans, but you can adapt the colors to whatever team you root for. You can also use whatever numbers you'd like on the jersey. (We picked "09" for the year 2009.) Sure to be a handmade keepsake to treasure! 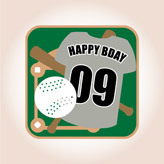 * Baseball Birthday Card SVG File Kit (click here to purchase from SVGCuts.com) - only $3.99! The SVG file kit also includes numbers zero through nine so that you can make this card with any number combination (not just "09" as we've done). Please note that these instructions, though detailed, are written for folks who are familiar with the basic operation of the Cricut machine. Also, please note that if you're using the original Cricut (not the Cricut Expression), since the original Cricut does not use 12" x 12" paper, you won't be able to cut out the envelope on your Cricut, you'll have to use another method for making an envelope. 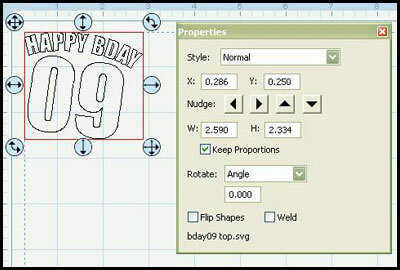 Select the file “bday09 top.svg" and click the Open button. The letters and numbers appear on your screen. 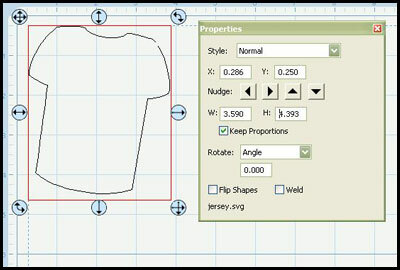 In the Properties window, make sure “Keep Proportions” is checked and enter 2.59 in the W field. Press the Enter key to apply. We cut this out of black paper, but you'll want to cut it out of whatever paper color you've chosen. 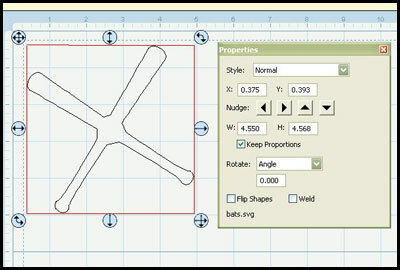 Arrange the shapes as you wish to maximize the paper you’re going to use. Get your paper ready on your mat and load it into your Cricut machine, being sure to choose the correct pressure for whatever paper you’re using. Choose the lowest speed setting. 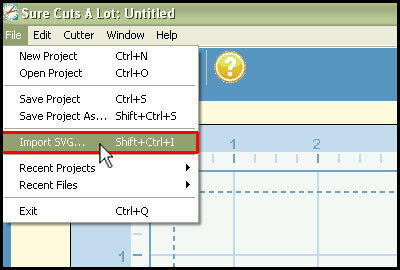 When you’re ready, press the Scissors icon button in Sure Cuts a Lot to begin cutting with your Cricut. Now for the bottom layer of the letters and numbers. We cut these out of white paper, but again, use whatever color of paper you've chosen. 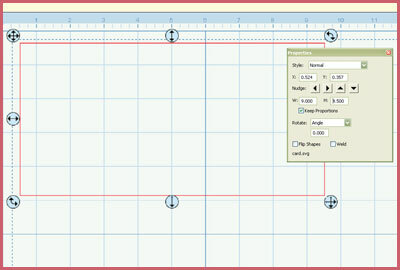 Starting with a blank on-screen cutting mat, go to File and then Import SVG. 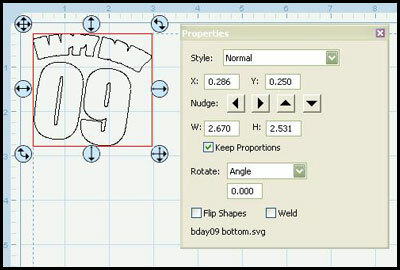 Select the file "bday09 bottom.svg" and click the Open button. The letters and numbers appear on your screen. 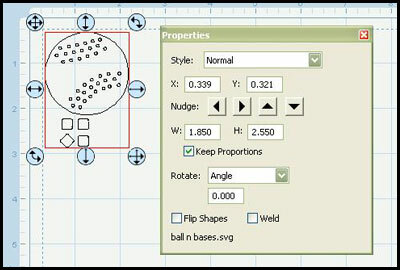 In the Properties window, make sure “Keep Proportions” is checked and enter 2.67 in the W field. Press the Enter key to apply. Again, arrange the shapes as you wish to maximize the paper you’re going to use. Get your paper ready on your mat and load it into your Cricut machine, being sure to choose the correct pressure for whatever paper you’re using. Choose the lowest or next to lowest speed setting. When you’re ready, press the Scissors icon button in Sure Cuts a Lot to cut with your Cricut. And now for the jersey! We cut this out of gray paper (go go White Sox!) but you'll be cutting it out of the paper you've selected (whatever, other baseball teams!). Import the file "jersey.svg" and size it in the same manner as before to 3.59" wide. Go ahead and cut this out using the proper pressure selection and a medium speed setting. Now all the elements for the jersey are cut out - nice job! Set those aside for now. 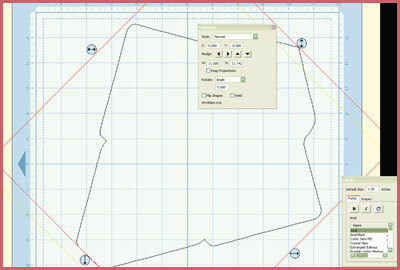 For the bats, on a blank on-screen cutting mat, import the file "bats.svg" and size it to 4.55" wide. Cut this from brown paper. 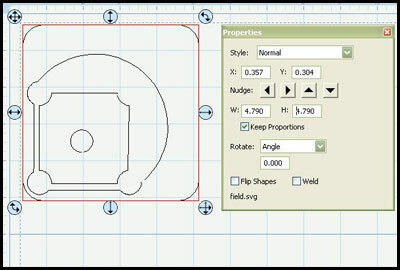 For the baseball and bases, import the file "ball n bases.svg" and size it to 1.85" wide. Cut this from white or off-white paper. 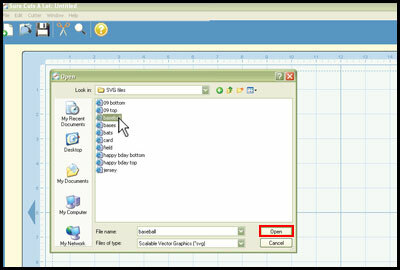 For the field, import the file "field.svg" and size it to 4.79" wide. Cut this from green paper. For the card, import the file "card.svg" and size it to 10" wide. Cut this from tan (sandy colored) paper. For the envelope, import the file "envelope.svg" and size it to 10" wide. Angle it so that it fits on your page and cut this from whatever paper you choose. Now all the pieces have been cut out and it's time to assemble everything! Glue the top layer of letters and numbers to the bottom layer of letters and numbers. Glue these then to the jersey and rub the dark brown ink pad along the edge of the jersey to give it a cool grunge look. Set aside. Weave your red embroidery floss through the holes in the baseball to create the stitched look as shown. A needle makes this much easier! We split the embroidery floss in half by unravelling it into two sections of three threads and only using one section of three threads instead of the whole thing with six threads. Basically, you want it to fit through the holes nicely. 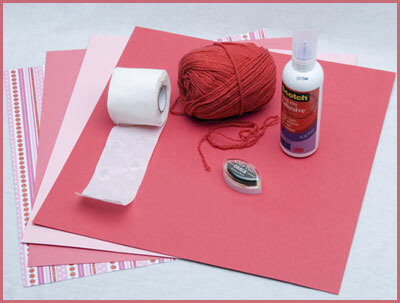 Glue the ends in place on the reverse side of the card so the threads stay put. Rub the ink pad around the edge of the ball. Set aside. Score the card down the middle if you have a scorer and fold (or just fold as best you can in half). Carefully glue the green field pieces to the card front. Glue the bases in place as well. Rub the ink pad around the edge of the front of the card. Rub the edges of the bats shape with the ink pad as well and glue in place. Use Zots or Pop Dots to affix the jersey and ball to the front of the card. 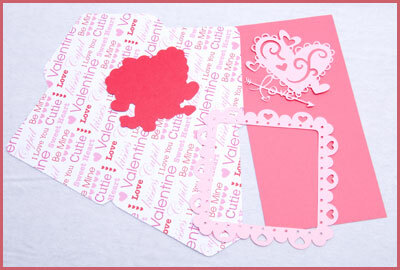 You can skip the Zots or Pop Dots and just glue the shapes to the front of the card, but it will be slightly less cool. Score, fold and glue the envelope and you are done - nice job! i love this card!! thank you!!! I want this file!It’s sold out on Etsy. Mary please make it available here so I can make it! THANKS it’s too cool to miss it – I’d even make it for my brother!!! !